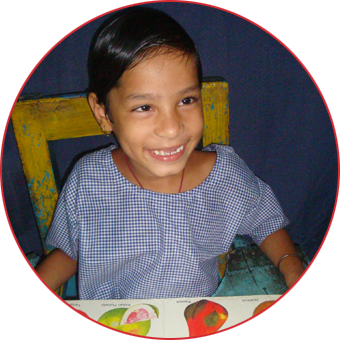 Jhilik Karak came to the Centre for Special Education at Bikash, when she was 3½ years old. She was assessed by the team of professionals and her major problems were in the domains of language & communication, physical and socials skills; in essence she has Cerebral Palsy with associated speech problem. At the beginning she couldn’t speak a single word; she used to communicate by crying and screaming. She can now walk and run normally. Presently she does not have any balancing problem. She greets familiar and unfamiliar people with a smiling face. She no longer screams or cries for her needs and wants. She can now get involved in the conversation with others. She can answer to “WH” questions meaningfully.